My Box Printing offers wide variety of custom takeaway boxes for all major takeaway restaurants, shops, stalls, events or businesses. This may include: chicken and chips shops, Chinese takeaway shops, sandwiches, fish and chips, wraps, salads, pizza, burgers and drinks. We are one of the biggest supplier of custom designed cardboard, corrugated, paper and plastic takeaway box packaging in UK. Our current printing range includes embossing, debossing, metallic,spot UV, Matt and gloss lamination. We only offer flat packaging, free fast delivery and also offers free artwork design consultation. Our unique, elegant, vibrant designs for takeaway boxes makes customer’s food takeaway event successful. We offer price match guarantee. 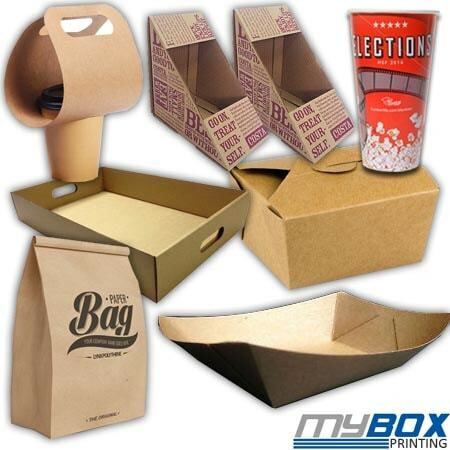 For Free quote, kindly email to sales@myboxprinting.co.uk. We were searching for premium quality kraft paper type cardboard boxes which are food safe and recyclable. My box printing offered us most competitive price and fast turnaround. When we received them, the quality of full colour printing, lamination and packaging was nice. They are indeed specialist in custom takeaway printing and packaging.